This workout is 31 minutes, with a 5 minute warm up walk, then alternate 1.5 minutes of jogging and 2 minutes of walking for 21 minutes, then walk for 5 minutes for cool down. Instead of going to Soos Creek, I jogged around our neighborhood. I stuck to the one workout today because I am still really sore. 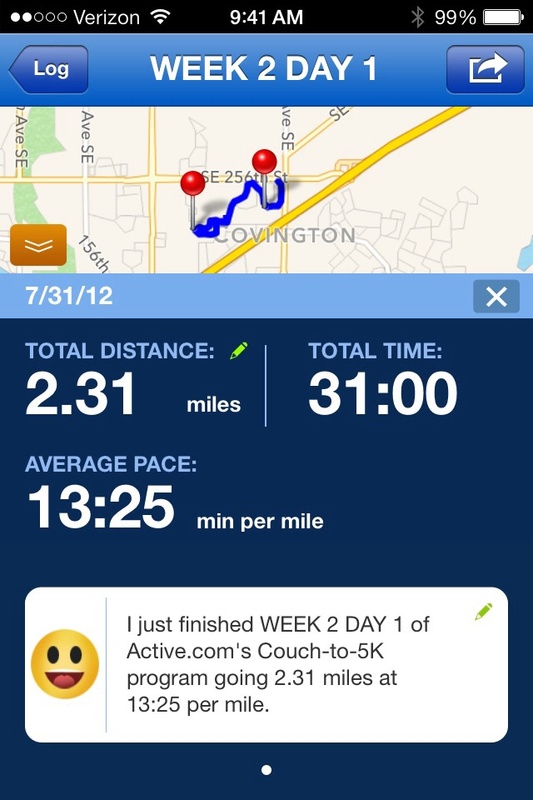 August 2, 2012: Yesterday was a needed rest/recovery day. I ran around the neighborhood again, but took a different route than the other day. I shaved a little bit off my average ppm. I am finding that I don’t need to stop running/jogging as often as the workout suggests. I only walked about half the times it prompted me to. This was a good day! This workout is 31 minutes, with a 5 min warm up walk, then alternate 1.5 minutes of jogging and 2 minutes of walking for 21 minutes, then walk for 5 minutes for a cool down. My diet is going fine, just very limited but I am sticking to it. The exercise with this diet should maximize the results. I am surprised that I am not really that hungry, it is just boring to eat things without dairy or sauces (I miss cheese and sour cream!!). I was motivated this morning when I spent some extra time trying on clothes that have not fit me for a very long time, and progress is showing! I just want to get below 200 pounds – ugh!! !